The morning of Thursday, April 12 started off with dust storm warnings in the desert southwest. We watched as web cameras showed the clouds and dust moving towards Colorado. In the Four Corners region high winds and dry dusty clouds were widely reported, folks could "taste" the dust in the air and feel the dust in their eyes. Phil Straub (CSAS employee) was at the Opus hut (San Juan Mts.) during the event and said it looked apocalyptic from about 4pm until the sun went down. 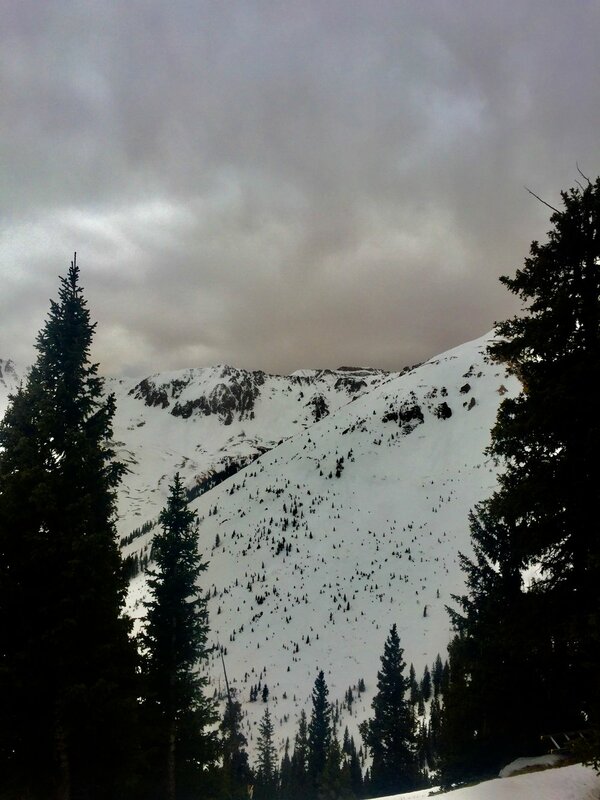 The majority of the event was deposited dry in the San Juan Mts., without precipitation, on top of dust layers D3/D4 which were already on the surface of the snowpack. This event looks to be widespread with reliable reports describing a super dusty Vail Pass and Vail Mtn of red/brown/rust coloration. Even reports of dust on vehicles in Boulder. Starting around 8pm precipitation followed the dust and high winds, we received 0.5" (13 mm) of water content at Swamp Angel and snow is in the forecast the rest of today and tonight. Currently, D3/D4/D5 are combined into one layer and sitting ~7" below the snow surface at Swamp Angel. After the storm passes we will sample the dust at Swampy and get revealing pictures of the severity of the event. The CODOS team conducted a portion of the April CODOS tour on April 11. Sites visited were on the Front Range, Hoosier, Grizzly, Berthoud, and Willow Creek Pass. We opted to delay sampling at the rest of the CODOS sites until after this current storm passes in order to assess the range and intensity of D5. You can expect a full April CODOS Tour report by the first part of next week. Abajo dust camera on April 12.